The Ark Petting Zoo is always a lot of fun no matter what we are doing. We spent last Tuesday trimming the goat’s hooves. They were very curious and wanted to come into the classroom area where we were working, but once they were in the classroom they tried to escape. The goats were nervous when we first began trimming their hooves because they weren’t sure what we were trying to do. We had a stanchion set up to hold their heads while we worked on one foot at a time. For most, if not all, of our goats this was the first time they have seen a stanchion, let alone been placed on one. Our stanchion is made of metal and has a wood platform for the animals to stand on to get them off the ground, just to make it a little easier for us to work on them. There is a U-shaped piece on the front that can be raised or lowered to fit the animals size with a chain that runs behind the head and clips to the other side. Very minimal and easy for them to be held in place. Once the goats were on the stanchion they relaxed and allowed us to lift one foot at a time to trim the overgrowth off. 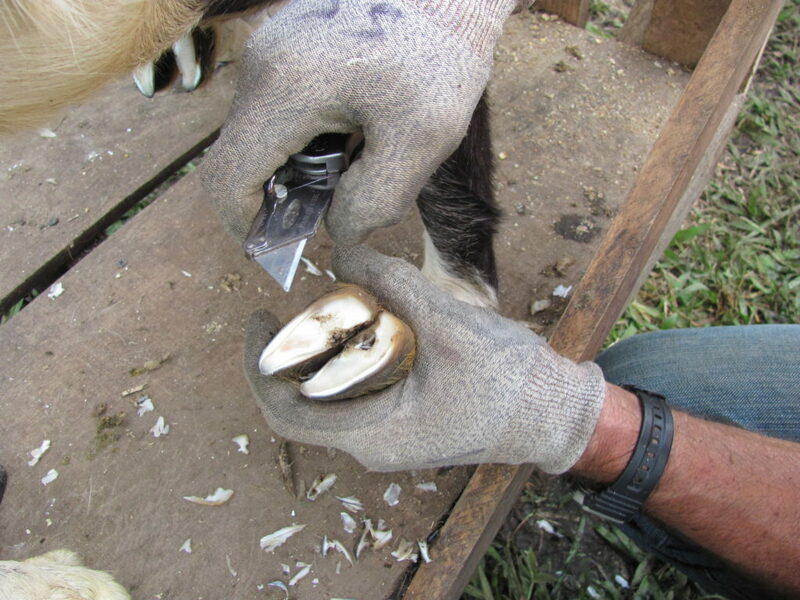 Goat hooves are some of the easiest to trim that we have on the Ranch. 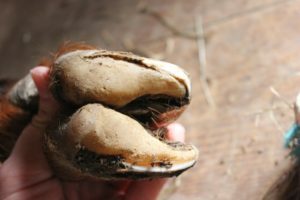 As the hoof grows it curls under so you can easily see what needs to be trimmed. You just take a pair of sheers that look similar to pruning sheers for the garden and cut all the over growth off. Once the side is clean cut the hoof is done. This is a simple process and our goats quickly realize they feel better so by the time we pick up the second foot they are calm. Once we are done and let them down and back into their playpen they don’t want to leave! We love our goats so much they provide hours of entertainment no matter what we are doing!